One dark, dark night in Burrow Down, a rabbit named Eliza Brown found a book and settled down...when a Snatchabook flew into town. It's bedtime in the woods of Burrow Down, and all the animals are ready for their bedtime story. But books are mysteriously disappearing. Eliza Brown decides to stay awake and catch the book thief. It turns out to be a little creature called the Snatchabook who has no one to read him a bedtime story. All turns out well when the books are returned and the animals take turns reading bedtime stories to the Snatchabook. What it’s like for husband-and-wife team Helen and Thomas Docherty to work together? Tom: Luckily Helen likes the way I draw, so when it comes to working together, there is a lot more discussion than disagreement and at the end of the day, it really feels like a team effort. Creating the illustrations for a book is a big job, deadlines can be tight and I’m often in a bit of a rush. So I really appreciate having another pair of eyes to spot where things aren’t working, how they could be improved or to add details and check for continuity. Our house is full of picture books and our daughters are at just the right age for them, so we are always reading new things and talking about the stories and characters. It’s a very happy (if a little chaotic) environment to work in. Helen: Our very first conversation (in a pub in Bristol, England) was about our mutual love of children’s picture books, so it’s really no surprise that we’ve ended up working on them together. When it comes to writing my stories, that’s obviously something I do on my own, but Tom is the first person I read them to, and he always gives me really insightful feedback. And when he is illustrating one of my stories (right now he’s working on the pictures for our next book, Abracazebra), I’m quite involved in the process – it’s really fun to discuss our visions of the characters and the setting. The only danger is that our work life can spill over into our home life (we both work at home) – but since we both enjoy what we do so much, that’s not a huge problem! A couple of weeks ago we had the official Snatchabook launch here in Swansea – it was really exciting to do this together, and of course our daughters were very proud of their Mum and Dad. 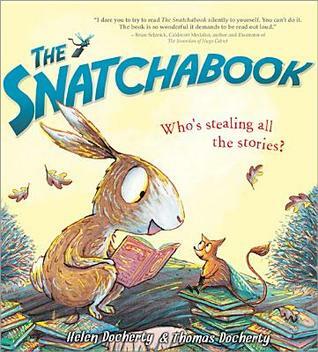 Have you had a chance to pick up Snatchabook yet? If not- check it out! It is a fun book and the illustrations are sweet. Let us know below if you have looked at this fun title!